I am just beginning to emerge from the flu that's kept me down for the first few days of Vermont Restaurant Week 2014. But venturing far hasn't been in the cards just yet. The last few days, I've kept close to home in South Burlington with excellent results. Around 12:30 p.m., the Bagel Place's line snaked almost out the door. This was no surprise with the deal the bakery and café is offering. 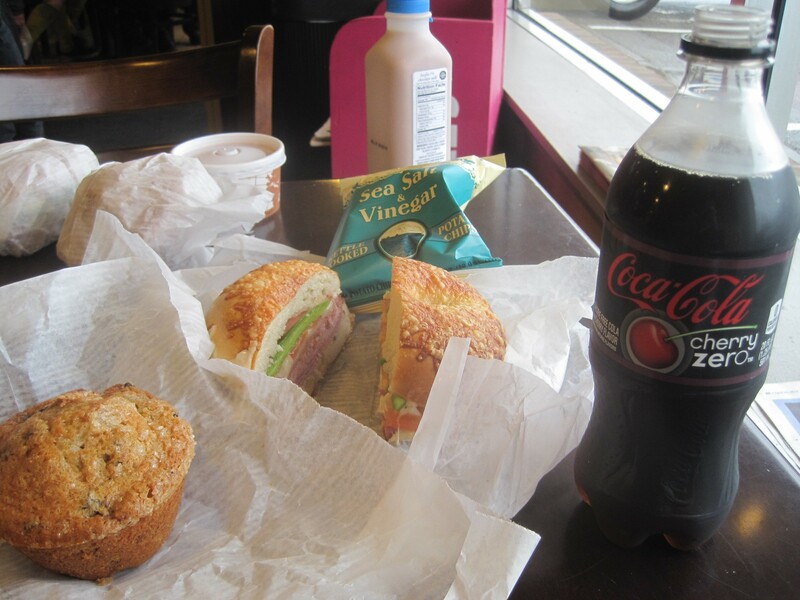 For $10, Restaurant Week customers choose a bagel sandwich, drink, chips or soup and a dessert. For some perspective, when I usually purchase an Italian sandwich there, it costs more than $7. For my Restaurant Week meal, I got three more items for less than $1 each. This wouldn't matter if the food weren't excellent. It is. 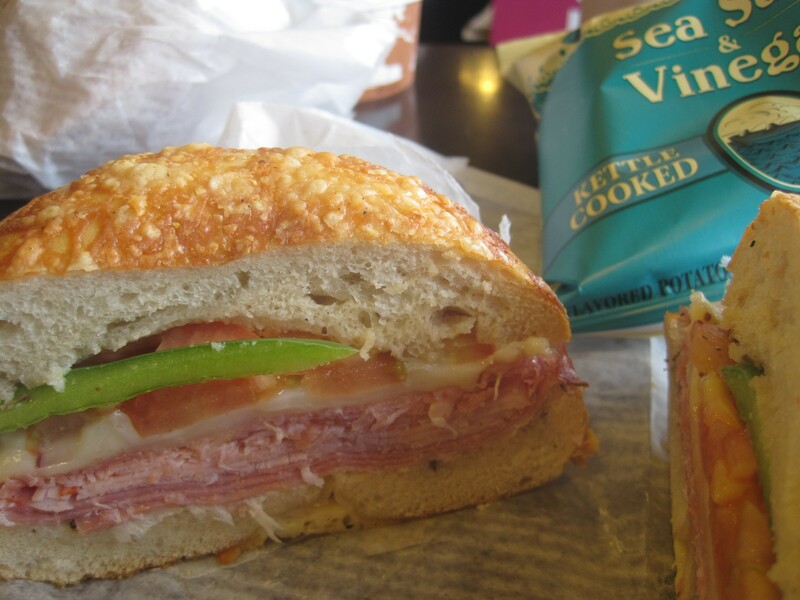 In fact, my favorite classic Italian sandwich in the area happens to be served at the Bagel Place. A serious sandwich served on a bagel? Don't knock it 'til you've tried it. A pile of Genoa salami, capicola and prosciutto are high quality. A melted layer of provolone cheese melds green peppers, lettuce and tomato. Finally, a liberal shower of herbed vinegar soaks into the cheesy base. It's kind of perfect, especially with a side of salt-and-vinegar chips and my embarrassing soda of choice, Cherry Coke Zero. This is normally enough for two lunches. But just for Restaurant Week, I got this, too. 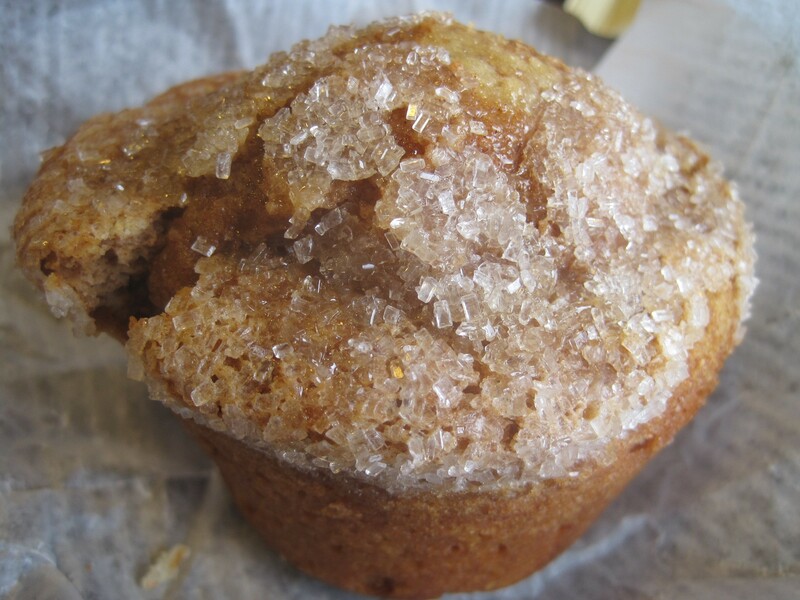 Behold the caramel muffin. The bountiful breakfast pastry worked just fine as dessert for me. Imagine a cinnamon-filled coffee cake with an exceptionally sticky texture, and you've got some idea of why it took me two days to eat the thing. Believe me, though, I didn't mind. In fact, all the leftovers were welcome at my house. My dining partner's Chicken Guac sandwich — chicken with bacon, garlic mayo and guacamole — was just as good the next day. But his tomato-cheddar soup and blueberry muffin never made it home. I was glad I'd made a reservation for dinner just a block up Williston Road at the Wooden Spoon Bistro. Even on a Monday night, the $25 Restaurant Week prix-fixe had attracted a crowd. With good reason. Pound for pound, it was one of the best Restaurant Week meals I've had in the event's five years. I was worried at first this might not be the case. Some items had been changed from what we list on the online menu guide. For example. I was looking forward to spring pea soup with prosciutto. It was replaced by sweet corn soup with goat cheese. The intense broth quickly made me forget the pea soup. Speckled with soft kernels, the soup was so good, I didn't even think about the fact that the central veggies is out of season. 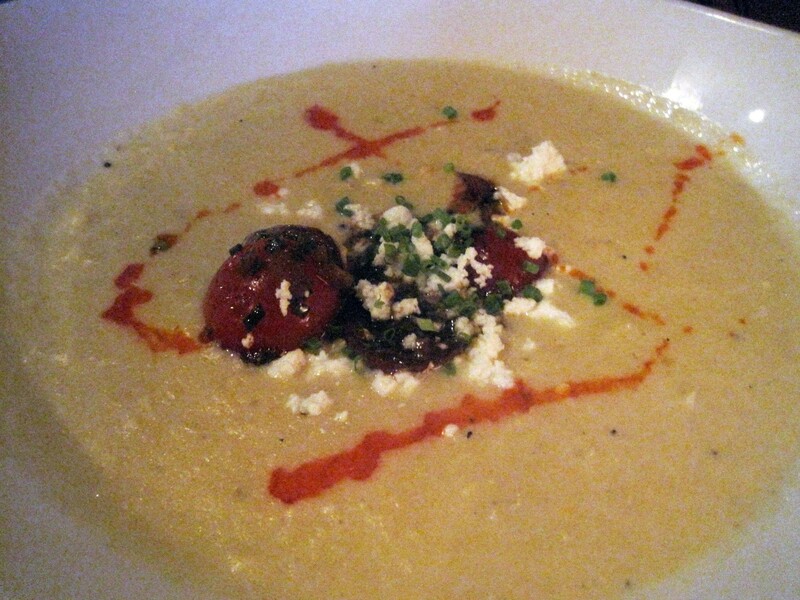 Crumbles of goat cheese and tender grape tomatoes added a welcome edge of acid to the sweet soup. 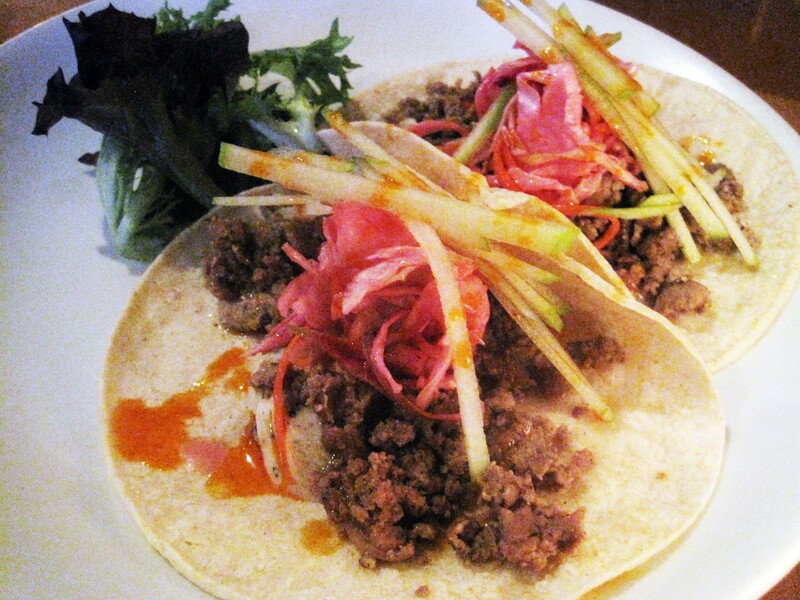 But I was even more impressed with the duck tacos. It was in that pair of tender, petite tortillas that I learned of the marvels of brown-butter mayonnaise. What is it? Serious stuff that combines rich, buttery taste with the vinegared zip of mayonnaise. The sauce lit up the cinnamon-enchanced ground duck like a flare. Not that the taco wanted for bright flavors as it was. Pickled cabbage and matchsticks of green apple lent their own natural gifts to the wonderfully balanced dish. It's rare that I'm enticed to order not only a vegetarian entrée but (gasp!) a vegan one. But the sesame-coated soba noodles were a spring treat that grabbed me more than a pair of fish dishes. Pea shoots, radishes, carrots and haricots verts were all tangled in the nest of tender noodles and flavored with a soy-ginger vinaigrette. 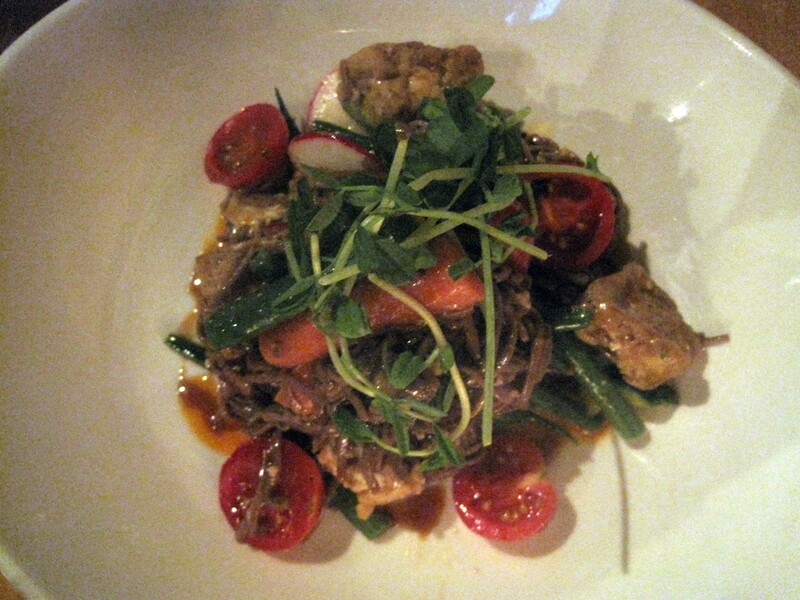 But for this meat lover, the delightful noodle dish couldn't compare with the sizable log of short rib pictured above. The meat was rendered so as not to reveal a speck of excess fat. The beef required only a light prick from a fork to separate a bite from atop a pile of creamy, salty mashed potatoes. 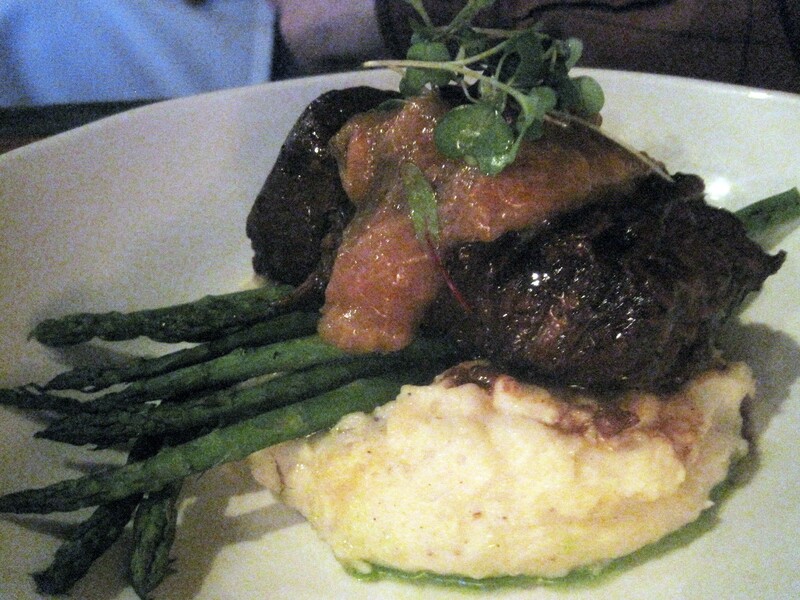 Asparagus was cooked al dente, but the spring star of the dish was a pile of tangy, homemade rhubarb jam atop the beef. The meal wound down with a pair of desserts. The cheesecake was sufficiently chocolaty to distract me from that fact that it was cheesecake, one of my least favorite desserts. 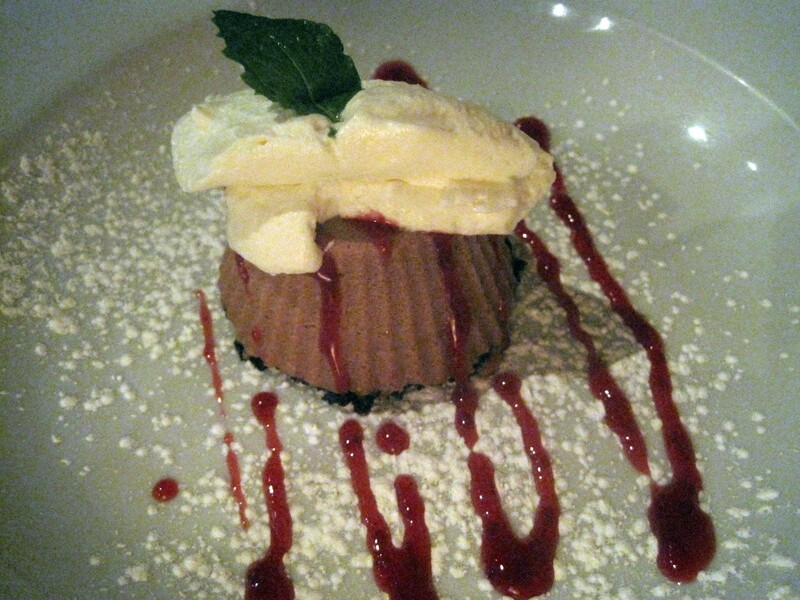 I was able to think of it as a heavy chocolate mousse. 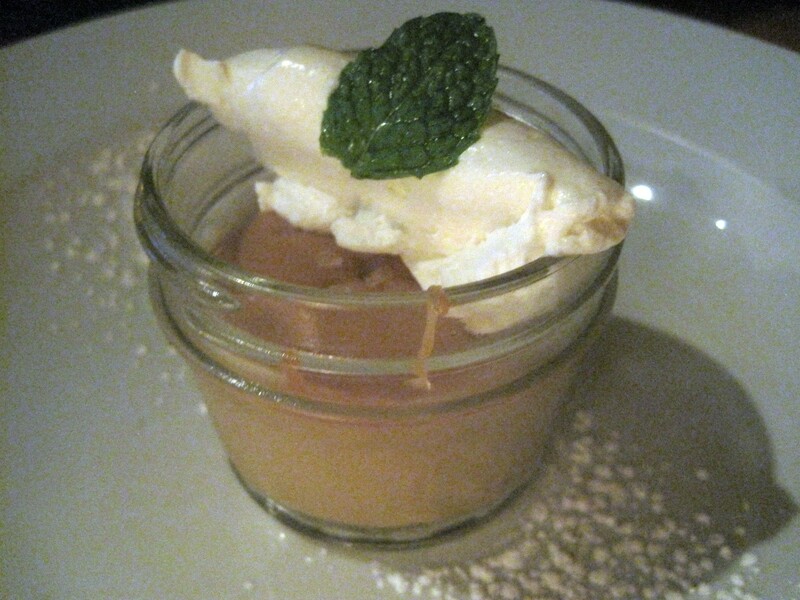 A petite caramel pudding required no such tricks. The burnt-sugar flavor was strong but the sweetness was mitigated with big salt crystals sitting at the bottom of the jar that held it. Despite the fact that I live nearby, for some reason, the Wooden Spoon is rarely on my radar when I'm planning a dinner out. Last night's meal certainly changed that.